Butterbear is one of my favourite Christmas bath bombs to get when I am in Lush. 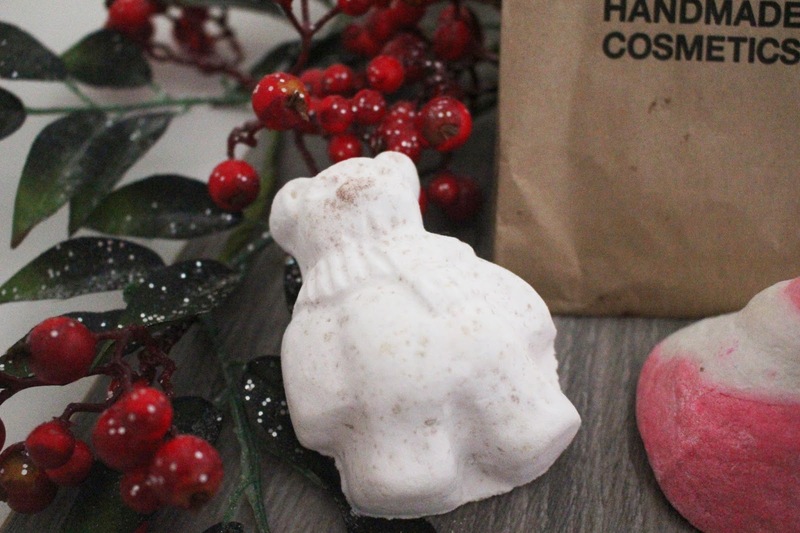 It has Fair Trade Organic Cocoa Butter (which softens and conditions the skin), cocoa powder (which softens the skin) and Ylang Ylang (which gives a beautiful sweet and floral scent to the bath bomb). This is perfect for anyone who is sensitive to really strong scents as the scent on this bath bomb is not too overpowering - instead it has a beautiful, soft sweet scent that is not too sickly. I almost get a vanilla whenever I use this bath bomb and it just helps to calm me down after a stressful day. I love how moisturising and soothing this bath bomb is and it leaves my skin feeling so soft and nourished. It is perfect for those harsh winter days that leave our skin feeling dry. Also, how adorable is the presentation of this bath bomb; it is so cute and I always have to have it in my bathroom at Christmas! The Butterbear bath bomb is only £3.95 and will be loved by any age. I will first of all say that my Snowman bubble bar is looking a bit worse for wear - when I purchased it, it wasn't missing a button or an eye but when I got it out of the paper bag I noticed that they had fallen out and they were no longer in the bag. 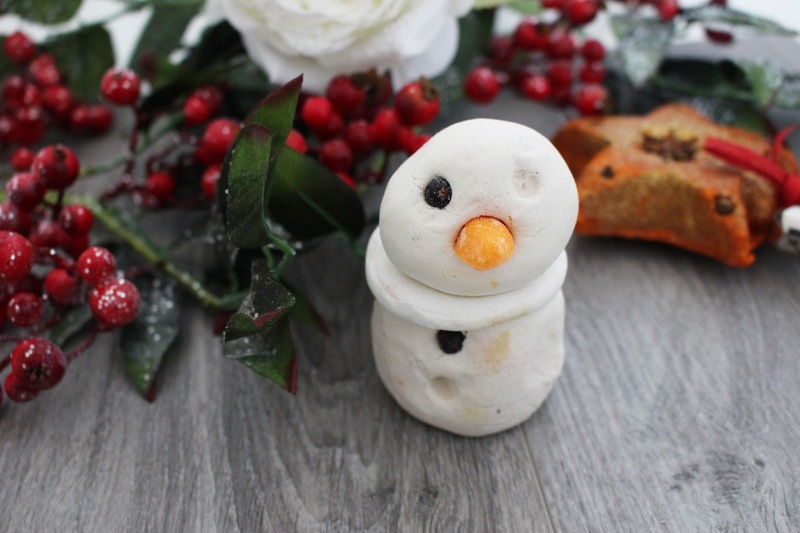 But even with an eye missing, this snowman bath product is still so cute and is perfect to have on the side of the bath to make your bathroom look more Christmassy. This bath product has Sicilian Lemon Oil (to uplift and cleanse), Lemon Myrtle Oil (to uplift and refresh), Soya Milk Powder (to soften the skin) and Fair Trade Shea Butter (to nourish and hydrate). A bubbleroon is essentially two bubble bars stuck together and is a bubble bath in a solid form - all you have to do is break off a bit and crumble it under the tap to create bubbles. I will say that I have to use quite a bit of the bubble bar to get as many bubbles as I desire but it still lasts me a long time and the great thing is that I can use this on multiple occasions. I love citrus bath products and this is perfect for anyone who love lemon as this does truly smell of lemons. It also hydrates my skin and leaves me skin feeling so soft when I get out of the bath. Plus this looks so cute on the side of the bath! The Snowman Bubbleroon costs more than a bath bomb at £4.25 but you crumble pieces off and can use it on multiple occasions. I have purchased the Golden Wonder bath bomb for the last two Christmases and it is my all-time favourite Lush product in the whole Christmas collection. They have even bought out a Giant Golden Wonder and I am so tempted to buy it because it is my favourite. This bath bomb has Cognac Oil (to give a fruity and festive scent), Lime Oil (to uplift and protect) and Sweet Orange Oil (to refresh and uplift). It is not Christmas if I do not buy this bath bomb and I always use it on Christmas Eve. What I love about this bath bomb is that is is so massive that you can easily split this into two parts and then you can have it in two baths rather than wasting it in one bath. 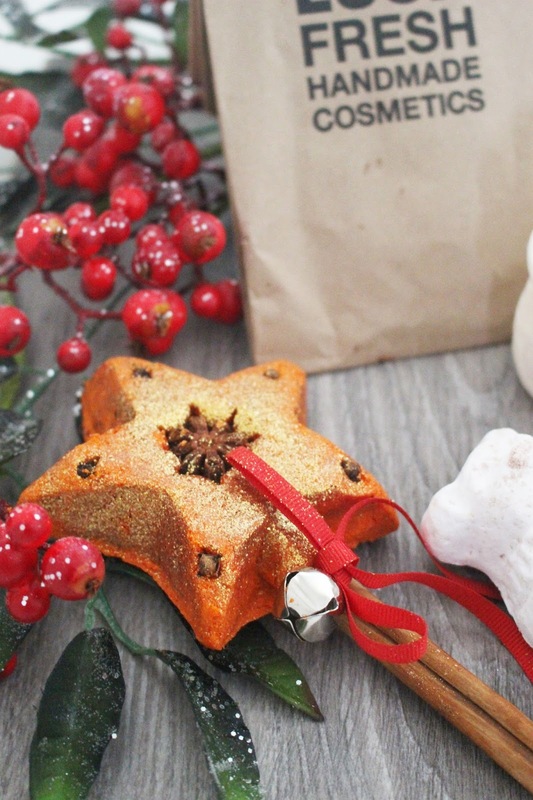 I love the citrus scent of this bath bomb and if you are someone who is not keen on sweet or festive spices then I would recommend trying this bath bomb as it is amazing. This is a little package of joy that turns the bath into a beautiful turquoise blue. The only thing that I am not keen on is the amount of glitter as it usually sticks to my bath and is so difficult to remove but is definitely worth it. I love this bath bomb the most and hope it never gets discontinued and the Golden Wonder bath bomb is £4.50 from Lush (but like I said you can easily split this into two or even more parts to get the most out of this bath bomb). You cannot go into Lush without picking up the Candy Mountain bubble bar (which has become a popular favourite amongst bloggers and YouTubers). It's almost a rule that you cannot do a Christmas shop in Lush without buying Candy Mountain. This is probably the sweetest bath bomb out of the whole collection which some people may find sickly, but I personally love the scent. It has the same super sweet scent that Snow Fairy has and you simply crumble it under hot running water to create lots of bubbles. It leaves the bath with clouds of shimmery pink bubbles and has a dreamy candy floss scent that I absolutely love. This bubble bar has Vanilla Absolute (to give a sweet and comforting scent), Sodium Bicarbonate and Cornstarch (to leave a silky feeling to your skin). I always buy this at Christmas as it is a tradition and I get so many uses out of this bubble bar that it is definitely worth the price. This is the cheapest bath product in this haul and the Candy Mountain bubble bar only costs £2.95, making it a great stocking filler or Secret Santa gift. 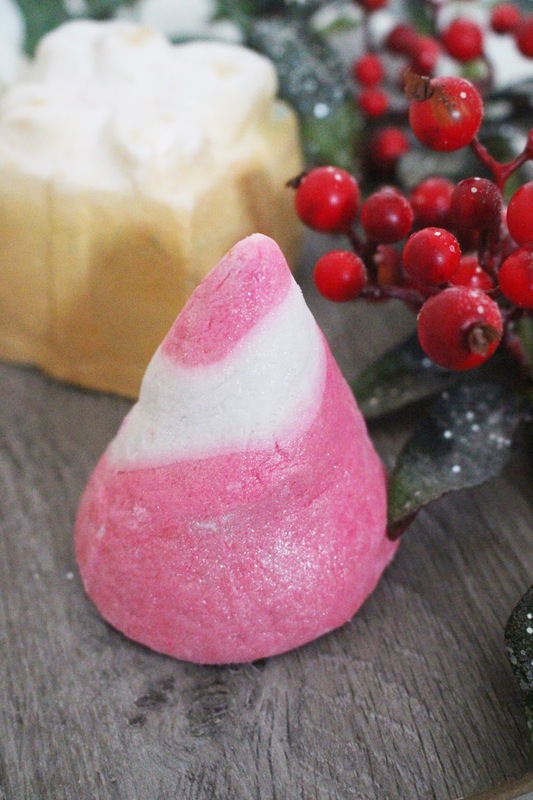 The one thing that springs to mind when it comes to the Magic of Christmas reusable bubble bar is 'Christmas'. This is the one Lush product you need if you love the traditional Christmas scents of cinnamon and mulled wine spices. Essentially this is Christmas in a bubble bar form. Firstly, this is probably the prettiest Lush bath product in the whole Christmas collection - and adults and children will love this wand shaped bubble bar. 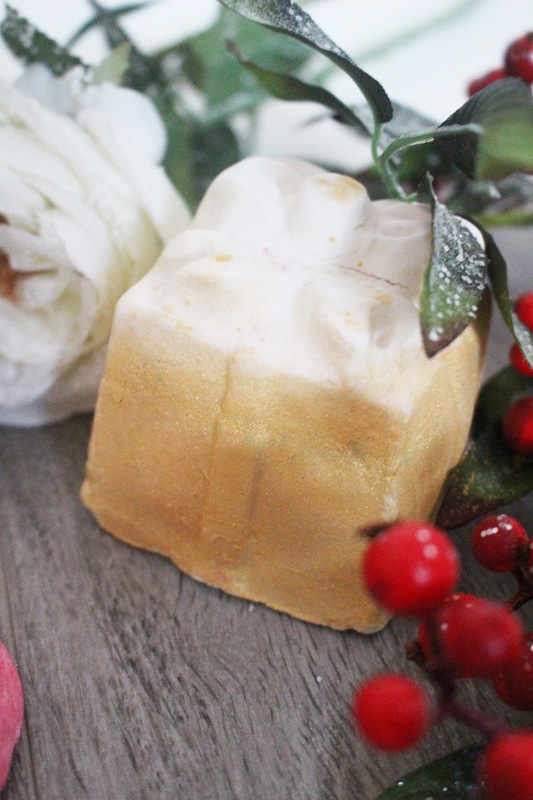 In this bubble bar, there is Cinnamon Leaf Oil (to give a Christmas spiced scent), Almond Essential Oil (to give a sweet scent) and Sweet Orange Oil (to refresh and uplift). If you are not keen on spicy scented products, then this will not be the product for you although the Christmas spice is not too strong. I am not usually a fan of cinnamon and mulled wine spices but this scent is beautiful and almost smells of marzipan mixed with cinnamon. This is just beautiful and I love how it is on a cinnamon stick and is sparkly and just encapsulates the Christmas spirit. This is reusable and all you have to do is hold the bubble bar under the running tap or swirl it in the bath water to get the bubbles - then you leave it to dry and re-use it whenever you want. 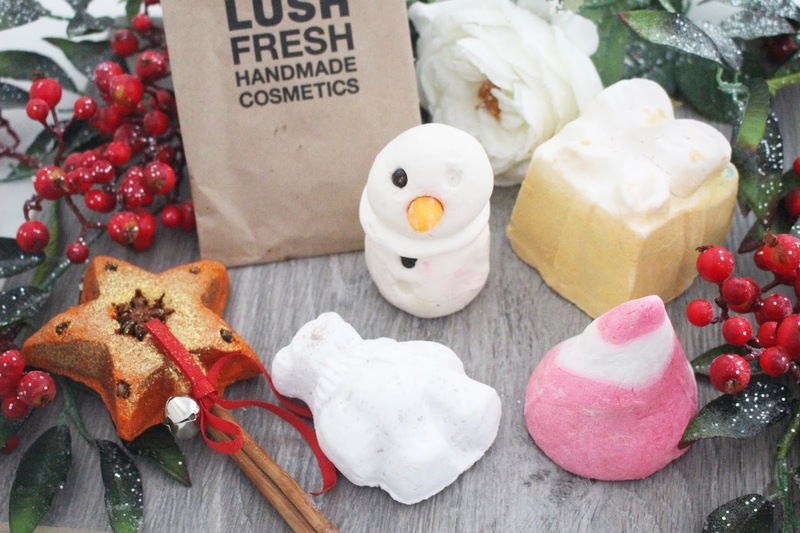 This is the most expensive item out of this entire Lush haul and costs £5.95, but the Magic of Christmas reusable bubble bar is just Christmas on a cinnamon stick! Let me know what your favourite Lush products are during the Holiday season in the comments below!